Pocket knives are awesome inventions. The fold up and somehow contain half the items from your average tool kit. Scissors are great. They cut things. Case closed. Here's the surprising thing pocket knives and scissors also are: a ticket to an automatic three months in jail if you're found carrying either outside in Philadelphia. (1) Definition. Cutting Weapon. Any knife or other cutting instrument which can be used as a weapon that has a cutting edge similar to that of a knife. No tool or instrument commonly or ordinarily used in a trade, profession or calling shall be considered a cutting weapon while actually being used in the active exercise of that trade, profession or calling. (2) Prohibited Conduct. No person shall use or possess any cutting weapon upon the public streets or upon any public property at any time. (3) Penalty. The penalty for violation of this section shall be a fine of not less than three hundred (300) dollars and imprisonment of not less than ninety days. There is a lot about the way this law is written that is extremely galling, but I'll just hit the highlights. It makes an unlawful weapon out of anything that 1) could be used as a weapon - basically everything and anything - and 2) has a cutting edge similar to a knife. Hence, my pocket knife and scissors examples above. 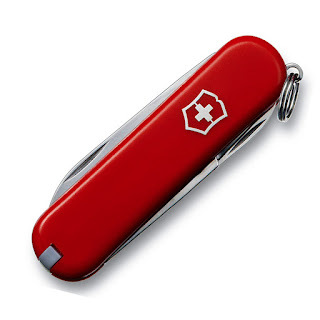 The law carves out a small exception for people that use a knife for work, but only if the knife is "actually being used in the active exercise" of the work. Driving to your restaurant job with chef's knives? Too bad. "On your way to work" is still illegal. But here's the real zinger: Anyone found guilty of this ordinance must not only be fined, but actually be put in prison for "not less than ninety days." The ninety days part is what really scared me when my friend first brought this law up (along with his legitimate fear of being arrested for something that felt like it should be legal). While I couldn't find any record of Philly's judges interpreting this ordinance one way or another, there is strong reason to believe that the law absolutely means what it says: If the Philadelphia Police decided to arrest you for carrying a pocket knife, "90 days in prison" would really be the end of it. Fortunately, there is a difference between laws on the book and laws you get arrested for. When push comes to shove, your average Philadelphia police officer probably has better things to do than arrest people for such a crime, and that is probably why this law is not talked about more. But the threat is still there. PA and it's municipalities have a number of strict and surprising laws that people don't think about. We don't think about them because they involve conduct that doesn't sound illegal. Unfortunately, sounding illegal or sounding immoral has very little to do with it. My friend got rid of his pocket knife the same day I wrote back to him. Crisis averted! But how many other laws like this exist out there, ready to grab the unsuspecting? As time goes on, I intend to find out.